I love Autumn. Red and yellow leaves, pine cones, pumpkins, halloween, bonfire night, the whole season is just heavenly to me. I really love decorating the house to follow the seasons. The house always feels so empty once the Christmas decorations are down, so I make sure the house is full of spring bulbs to bring the New Year in. Then of course the Easter tree comes out, then ,in my family, the Summer is dominated by birthday decorations and Autumn is no exception. This year i found some wonderful acorn garlands in a boutique shop in Lewes, that have been hung around my kitchen. I love bringing elements of the garden into the house, whether thats flowers, herbs and even acorns! Mini pumpkins are always a fav, these little gems pictured below look lovely in pots or scattered on window sills. I will be spraying them gold later of course! I found this lovely pot from Anthropologie. The richness of the orange really reminds me of the season and I love to put the mini pumpkins next to it. I am a big fan of wreaths, they are not just for Christmas. My Autumn wreath below smells wonderful as it is based in herbs, decorated with dried apples, pine cones, dried chillis, terracotta pots, and pumpkins. A fabulous display to celebrate this wonderful season. They are a beautiful addition to any house. 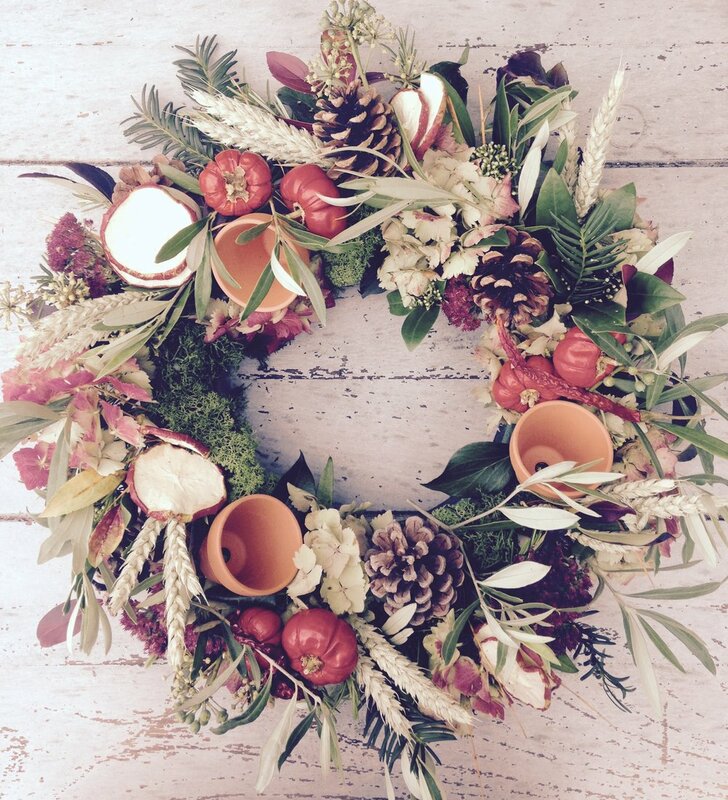 In a few weeks I will be posting a blog on how to make a wreath such as this, so watch this space! Our autumn box workshop is fully booked which is wonderful. I am looking forward to creating some beautiful seasonal displays with our students. If you are interested in coming to a workshop please have a look at our workshop page for lots of exciting classes.